Elvis is IN the building!! I was so excited to see the new Elvis stamp line at Cornish Heritage Farms! I'm still smiling from ear to ear as I post this! I know I'm probably a dork but really . . . who doesn't love Elvis or at least a song or two of his? I even did some diggin' in the old cedar chest and found my original concert program and ticket stub from the last concert he performed in Houston. I wasn't very old but I remember the concert. My mom and I went. I still remember how excited I got when they started playing his entrance music! He died in 1977 so I'm guessing I was somewhere around 8 years old. My 4 year old son, Hayden, even knows who Elvis is and recognizes his songs. We like to listen to Elvis Presley: Greatest Jukebox Hits in the car. Of course, Hayden associates him with Disney's Lilo & Stitch. I will have to say that the '68 Comeback Elvis is my favorite. If they come out with a black leather Elvis stamp, that puppy's comin' home with me! 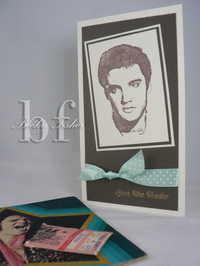 Okay back to the card, for this card I used ivory cardstock and brown bazzill cardstock, stamped Elvis with Java Versamagic ink, embossed "Love me Tender" in gold embossing powder and I used my Aqua Mist satin polka dot ribbon from PTI. Suspicious Minds is my favorite Elvis song . . . what's yours? How cool are these carrots! I found them while browsing blogs the other day and fell in love with them. I found them on Ellen Hutson's blog. 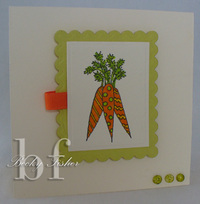 They are called Organic Carrots and they are by Lockhart Stamp Company. I used my Nestabilities for this one on ivory c/s. I colored my image with my copic markers and I added some bella baubles to the bottom of my card. I left off the sentiment because I wasn't sure what I want it to say just yet. I'm taking advantage of Hayden passing out before 7 tonight . . . can you tell? This is all Papertrey Ink . . . well, almost. I really like their new line of cardstock, ink and ribbon. I used Aqua Mist for this card. I cut and embossed with my Nestabilities and stamped the monogram initial with PTI's Trajan Monogram Edition. I also used PTI's Borders and Corners Monogram Edition. I stamped the border and monogram in VersaMagic Java ink. The background stamp is from Cornish Heritage Farms. Can you believe that Easter is just around the corner! Saturday I made a quick trip to Archiver's and picked up a few Easter goodies. Both of these stamps are from Stampendous in the $1.99 bin. I used ivory cardstock and bazzill, my Nestabilities and my new paisley Cuttlebug embossing folder. I colored the images with my Copic markers. The ribbon is from Papertrey. While shopping at Archiver's I also picked up a couple of St. Patrick's Day stamps and will post something soon . . . I hope. I've actually been stamping but I just haven't posted. I think I'm kinda in a slump and not 100% happy with a few of my projects. We've all been there, right? Well, this card was made with all my new goodies that arrived this week. There are so many yummy new stamps and supplies out there right now that I would like to have, but I have to tell you, I have been pretty good with my spending . . . just picking a few things up here and there staying within reason. As you can tell, I'm still on my birthday card kick. This one was made using my new Papertrey goodies. I used the Spring Moss cardstock, ink and ribbon. If you have not ordered yet, what are you waiting for!? These supplies are EVERYTHING Nichole said they were and more! The cardstock is sturdy and inks nicely. The ribbon is gorgeous and the ink colors match everything perfectly. I used my new Cuttlebug paisley embossing folder and my new Hey There Cupcake stamp set from Stampendous. All of these supplies were purchased from Eclectic Paperie. How can you go wrong with black and white, right? This is a clean, simple little card that I made using another Hero Arts stamp set that is from the Clearly Archiver's collection. It's called Fabulous Birthday. If you're lucky enough to live near an Archiver's you should check it out. Great store! Anyway, back to the card . . . I used Bazzill cardstock, 1/4" gingham ribbon, a little bling and bitty Primas from the Got Flowers Deux in black. That's it. Pretty simple, huh? 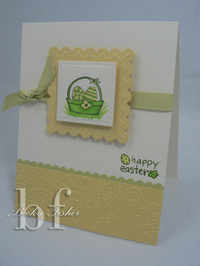 This is one of the cards I made two weekends ago while visiting my friend Stephany in San Antonio. I have say I love my Bellas! They are so doggone cute! 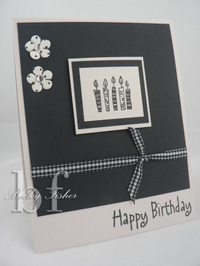 For this card I used Bazzill cardstock and Basic Grey. My layout inspiration came from Mish Mash. Michelle's designs are always cute and inspiring for me. I also loved the way she used this particular background stamp from Cornish Heritage Farms for one of her card designs click here to see. 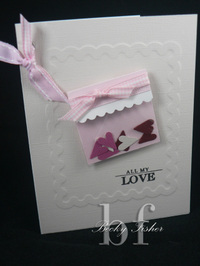 The bella is called Cuppacakeabella and the sentiment is from Hero Arts in a set called Birthday Messages. Leaving for San Antonio in the a.m. Boy, was I ever glad to see Friday get here! This has been one of the longest weeks I've experienced in a LONG time. Maybe because I spent zero time stamping this week . . . sure makes for a long week, doesn't it? First, my house was in dire need of cleaning, sanitizing and de-cluttering. That kind of stuff can really get away from ya, lemme tell ya! Second, I had to pack up all my stamping toys because I am heading out to San Antonio in the morning to spend 24 hours of some serious stampin' with my friend, Stephany . I have 2 bags, a roller cart full of cardstock and my little tool caddy all packed and loaded in my Tahoe. Do you think I've packed my clothes yet? Nope! That's the easy stuff . . . that bag will be packed in the morning as I'm walking out my door. So, since I didn't stamp at all this week, I don't have much to share but will have a ton of goodies to share on Sunday. Until then, this was a quick little card I threw together a few weeks ago using Sledding Poochie from The Cats Pajamas. The printed card was from a box of DCWV cards that I bought at Hobby Lobby last year after Christmas on clearance. The ribbon was from the Home Goods store. If you like shopping at Marshall's, Ross, or TJ Max, you'll love this store. It's nothing but home goods . . . dirt cheap! Sprinkle a little thanks . . .
Well, no stamping last night . . . had to catch my weekly dose of Nip/Tuck. I don't watch much TV but I do love a juicy Nip/Tuck episode! Anyway, tonight I decided to pull out some old ribbon and stamps. The ribbon is some I bought probably about 4 years ago and Sprinkle is from The Cats Pajamas. I bought her probably almost 2 years ago. The sentiment is from Close to My Heart. I used vanilla bazzill for the card base. How 'bout those eyes and collar . . .you like?